Get to know us better here and please get in touch with us directly at +65 6466-4475 should you want to have a further discussion. To what degree does IIS keep parents informed of their children’s progress? Our admissions criteria places great importance upon family involvement and the extent to which families want to be a part of their children’s education. As a school, we can’t do this without you. It takes a village, after all! We value and expect open communication between teachers and parents. Parents are encouraged to stay in touch via email, the student communication booklet or by ringing the school front desk at +65 6466-4475. Students can arrive from 8.45am onward. Classes begin at 9am and finish at 2pm for students in Primary School. Students in Middle School and High School finish at 3pm. Extra-curricular activities start from 2pm on specified days. For details on the extra-curricular activities offered at IIS, please contact the school’s front desk. What is the homework policy at IIS? Homework is essential for students to master what they have learned during the school day. IIS therefore places high importance on our students’ daily homework assignments. Each student is expected to complete homework assignments and hand them in by the specified deadlines. Does IIS provide bus transportation for students? Yes, limited door-to-door bus services are available for the IIS students who fit onto existing bus routes. Please contact the IIS front desk at +65 6466-4475 to find out more. Do IIS students wear uniforms? Yes, IIS students wear a uniform which can be purchased from Lim Meng Keng in Holland Village Shopping Centre directly. It is mandatory for students to purchase at least 3 sets of uniforms. Does IIS take students on outings and excursions? IIS is run across four terms. During each term, an educational outing is planned for our students. We organise exciting outings in line with our belief in dynamic learning and incidental teaching. Parents will be advised of each outing and the corresponding details closer to the excursion date. Is IIS a "nut-free" school? No, we are not a nut-free school. However, it is very important that you inform the school and teachers about your child’s allergies and/or other medical conditions so that we can make every attempt to safeguard him/her. Can students be expelled from IIS? IIS incorporates a variety of psychological and socio-emotional approaches to teaching students. As such, when students are often getting themselves into trouble, an action plan is first set in place, which incorporates support from teachers, parents, counsellors and therapists. We endeavour to work together as a team to rectify the student’s struggles. It is extremely important during such times that parents work collaboratively with the IIS team both in the school environment and in the home environment. Should the student continue to be a threat to himself/herself or others, then suspension and ultimately expulsion are possible consequences. To what degree does Little Tykes keep parents informed of their children’s progress? Our teachers closely communicate with parents on a daily basis. They are always available to speak to parents during drop-off and pick-up on school days. In addition, we also use Seesaw, a digital platform that showcases our students weekly learning highlights and provides personal portfolios for parents to see their child’s progress. At Little Tykes, we start our day at 8:30am and finish at 12:30pm with an option to extend to 3:00pm, if required. Please speak to our friendly Admissions team with regards to the extended option. Do Little Tykes students wear uniforms? 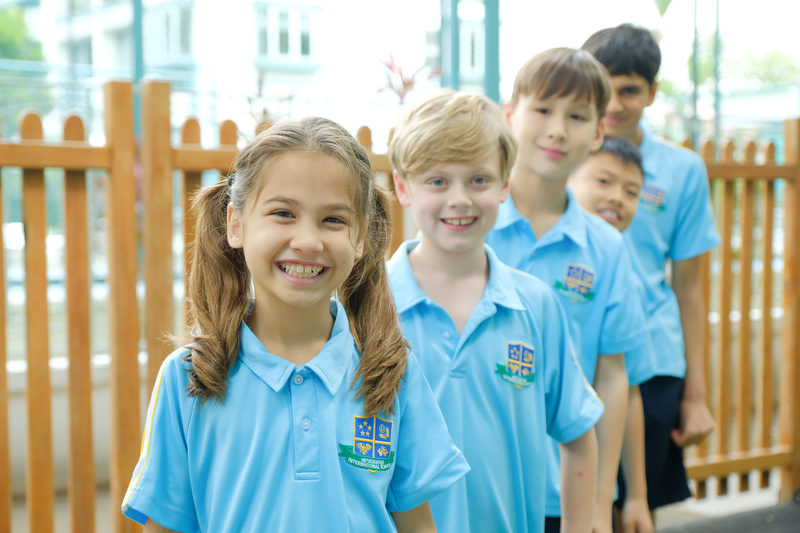 Yes, our students do wear a t-shirt uniform that can be purchased from reception, please kindly ask our Admissions team for more information. Do Little Tykes go on outings and excursions? At Little Tykes we provide exciting excursions during the end of each term, we invite our parents to join us so that everyone can enjoy the school field trips together. Is Little Tykes a "nut-free" preschool? We recommend our Little Tykes to bring a change of clothes, hat, a packed lunch, diapers, wet wipes, medication (if any) mosquito repellant and sunblock lotion or spray. During their school day, our Little Tykes will enjoy a morning snack that is provided by the school, this is usually fruit and healthy nibbles. For their lunch, we request that parents provide a packed lunch for their child to bring each day. If your child has any allergies, it is very important that you inform the school and teachers about your child’s allergies and/or other medical conditions so that we can make every attempt to safeguard him/her. What enrollment options are available at Little Tykes? We offer flexible 2, 3 and 5-day options at Little Tykes, please contact our friendly Admissions team for more information. What time does Tea & Tots begin? Tea & Tots promptly begins at 3:30pm and will finish at 4:45pm. We advise for newcomers to arrive 10-15 minutes early to make sure you have everything that your baby may need and can settle into the session. What do I need to bring to Tea & Tots? We request both adults and babies to bring a pair of socks, water bottle and any other necessities your baby may need (for example, diapers). How long are the sessions for? Tea & Tots is a 75-minute playgroup session, beginning at 3:30pm and finishing at 4:45pm on Tuesdays and Thursdays. Are there make-up sessions at Tea & Tots? Yes, if you miss a session then just let us know at the front desk that you would like to make-up the session and we will happily arrange it for you (depending on availability). Is it a parents-only accompanied playgroup? At Tea & Tots we understand that parents may not be able to attend, we happily welcome grandparents, aunties, uncles and helpers to our playgroup. We ask that parents let us know and confirm who will be accompanying their baby to Tea & Tots if they are unable to. Is there food provided at Tea & Tots? After lots of play, everyone is invited to tuck into healthy and yummy snacks! Our tots will enjoy fruit and healthy nibbles while our adults are treated to pastries or cakes and of course, tea and coffee! Can I pay online for Tea & Tots? We currently do not accept online payment, once booking your session and upon arrival to Tea & Tots, we will settle payment at the front desk. Please note that for trials, we only accept cash. If purchasing a package, we will accept cash, cheque or EFT payment.